South Africa’s Piano Man is back with a new DVD and CD recorded live at the magnificent Sand Du Plessis Opera House in 2012. PIMP MY PIANO features fresh instrumental arrangements of some of the most well known classical melodies. 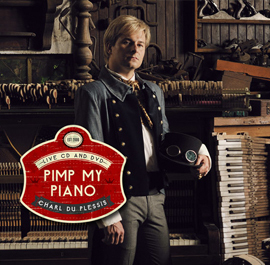 Charl du Plessis upgrades the listener’s musical experience of thepiano once and for all with beloved tunes like The Entertainer, Alla Turca by Mozart, The Girl from Ipanema and Flight of the Bumble Bee. Imagine the worlds of classical music with its romantic melodies and well-known favourites meeting face-to-face with the cool rhythms of rock, pop, blues and even jazz. This is a fresh new sound of crossover music pimped up with style. South Africa’s youngest Steinway Artist shared the stage with top local instrumentalists: Lizelle le Roux (violin), Jeanne-Louise Moolman (viola), Juan Oosthuizen (electric and acoustic guitar), Werner Spies (bass) and Hugo Radyn (drums). Original tracks by Du Plessis as well as music from the film Chocolat and all-new arrangements of music by Lady Gaga and Grieg fill this deluxe box set with LIVE DVD and CD. The DVD features all the on stage action as well as music videos and a behind the scenes documentary and interviews as a bonus feature.